Throughout the march to pay for a statue of Robocop in the city of Detroit, one voice has been absent: Robocop himself, or at least Peter Weller, whose face was grafted onto America's favorite cyborg lawman. Until now. With $50,000 committed for the statue last month following a campaign based on a single tweet, the past two weeks have been spent battling between supporters who see it as a much-needed piece of whimsy and attention, and critics, including Detroit Mayor Dave Bing, who question how a statue of a robot fits into the troubled city's priorities. 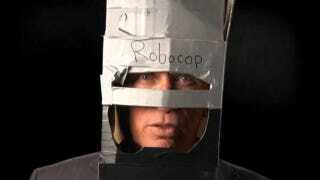 It's a dispute that Weller seems to get, especially when calling Robocop "the cyborg of self-respect."